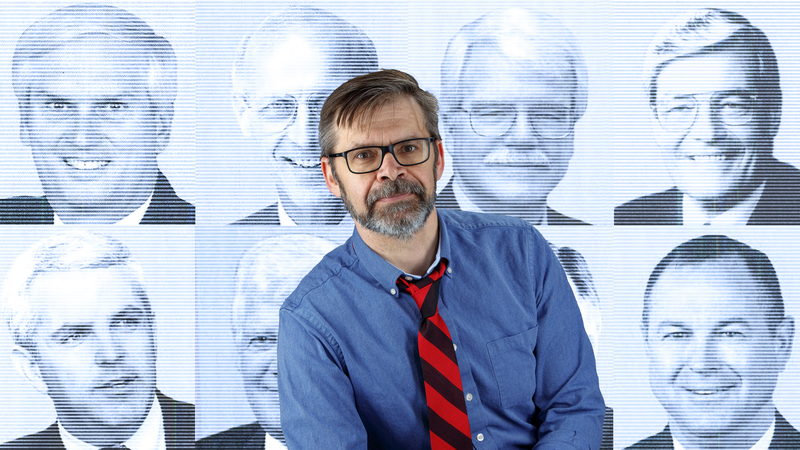 Kevin Smith, professor of political science, has published findings that people can choose liberals or conservatives by a viewing a person's photo or video. Behind Smith are photos from the 2003 Congressional Pictorial Directory. Top row from left: John Duncan (R-TN), John Olver (D-MA), George Miller (D-CA), Phil Crane (R-IL). Bottom row from left: John Shadegg (R-AZ), Jim McDermott (D-WA) and Dana Rohrabacher (R-CA). If playing in a high-stakes poker game, it may be better to face opponents on the liberal side of the political spectrum. That’s because new research from the University of Nebraska–Lincoln has demonstrated a correlation between political ideology and facial expressivity: Conservatives have better poker faces, while liberals may allow more tells. Previous research has shown that people can identify political affiliation from faces alone, but no one was quite sure why. Kevin Smith, professor and chair of political science, said the new paper, recently published in Politics and the Life Sciences, shows that it’s likely at least in part because liberals have more facial emotional expressivity. The research suggests that facial emotional expressivity is yet another biological difference in conservatives and liberals, said Smith, whose previous research has found biological predispositions in political beliefs. These findings open the door to more research questions, he said, such as whether liberals prefer more emotionally expressive leaders and whether the findings might be strengthened with more study of facial muscle reactivity. “Liberals reported being less able to stop from expressing emotions, while conservatives were a little more buttoned-down,” Smith said. This led to the second study, in which participants’ facial reactions were recorded with electromyography to measure the corrugator supercilii muscle while viewing positive and negative images. This muscle is situated above the eye and is involved in many facial expressions, including the frown. In the final experiment, images of two German lawmakers with neutral facial expressions and two with clear emotional expressions were shown to participants, who rated them on a political spectrum. Once again, the results showed that those with more emotional expression on their faces were perceived as more liberal. “President Obama was known for his coolness, and John Boehner was often seen crying,” Smith said. The study was co-authored by Johnathan Caleb Peterson, Carly Jacobs and John Hibbing.